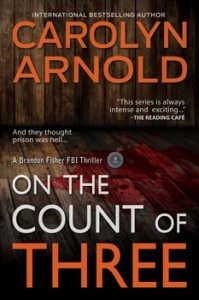 Carolyn Arnold is one of the best procedural novelists I have ever rad, so I was super excited to read On The Count of Three, the seventh novel in the Brandon Fisher FBI series. 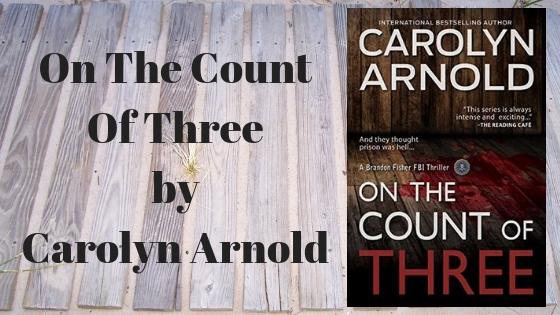 Carolyn Arnold’s attention to detail makes her writing so engrossing, riveting, that once I start, I am unable to stop reading until the last page is read. When the Night called to him, he felt the need to find one who is worthy of his attention. I don’t want him focusing on me. He counts down, preparing to wreak havoc on his victim, “One, Two….saved by the bell, the ringing telephone. Brandon, a special agent with the BAU woke to the ringing phone. His girlfriend Becky is a police officer so she knows the drill. Jack, Brandon, Zack and Paige are a team. But for how long? I always wonder how long a person can last in such a stressful position as the BAU? When is it time to walk away? Do they all become jaded over time? Inured to the evil they deal with? I wonder how and why the villain chose his gruesome method of murder. Serial killers have a reason for what they do, even if no one else can understand it. I am looking forward to watching Brandon’s growth from a rookie to a seasoned agent. It takes time and training and I am a patient person. I feel the agents pain as they arrive…just a little too late. It’s not all glamour, save the day action. The investigation is thorough and we go through it step by step, watching and learning. 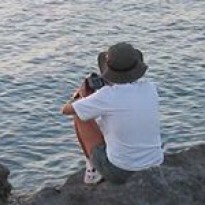 The tedium of questioning and more questioning and research. Criminal Minds is an awesome TV show that I watch religiously, but it cannot begin to cover…in realistic terms…what Carolyn Arnold covers in her novels. We are all byproducts of our experiences. It’s what each person chooses to do with those experiences that comes to define them.